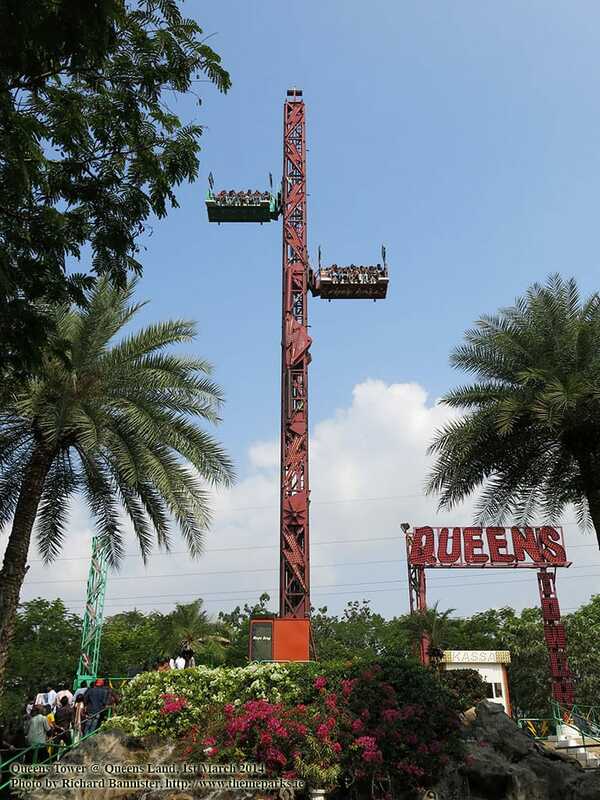 Queens Land in Chennai has a really odd looking free fall. I've never seen anything like it in all of my travels. Has anyone come across one of these anywhere else? That looks like a very poor design to me. I bet it has a lot of maintenance issues. Think of the stress on the ride vehicles when it reaches the bottom and comes to a stop. I'm going with portable, though, and there's a couple of giveaways. One is the doghouse, which looks like how you find things on a transportable ride, and the other clue is that big hinge about halfway up. The tower folds in half to lay the whole thing on a trailer. It reminds me of the smaller drop tower rides we find at state fairs these days. Whenever I see something unusual like that I always nose around for a label or a plate that might give a clue as to who the manufacturer is. I agree with LK, though. While being suspended out there would be a fun/scary sensation, it does seem like there might be a better engineering solution. And what a name: Queens Tower. It looks like it might be a pretty ride at night, though, with those lightning bolts all the way up. Thanks, Mr. Bannister. I love seeing stuff like that. And I, like a lot of us here, I'm sure, live vicariously through you. I'm going with portable because in the photos in the link provided, you can see the trailer and the tires. While I can't prove it, I think the ride was built by a Spanish manufacturer. The original name was "Trueno" (Thunder) and there's a Spanish vehicle plate on one of the trailers. There's photos of it at a fair in Europe over a decade ago. Hrm. Not sure how I'd feel about riding a portable drop tower on that scale. I can barely get on permanent installations of that size. If this ride were in my RCT park, I'd just station one mechanic *at* the ride exit - breakdown city. I love how the ad for the German fair shows the schematics of the towers over the years, superimposed over an old (blurred) photo of the Las Vegas skyline. not sure what Vegas has to do with traveling German fun fairs, but it's colorful. Riding those rides is a gamble? The whole park looks strange, especially the fun house which doesn't allow men in. Well, it's known world wide that a man in a funhouse is nothing but trouble, and no fun whatsoever. Then you have your roller coasters that don't allow children. And here, we thought Cedar Fair height restrictions were tough? I've not caught the latest ones yet, but I can tell you that Power Tower 2 looks extremely well built. Those German showmen know their business. I find it interesting that all of the shoulder harnesses appear to be connected on that ride. Must be fun to be the smallest person in the row. The stigma we have here in the US around traveling rides clearly doesn't translate to the shows in Europe. I don't know if my fears are rational or not, but I don't trust fair ride operators here. I belong to a Facebook group that is concerned with carnival rides, because I love flats, and in addition to a small amount of enthusiasts (like me) there's a lot of carnies and showmen as contributors. I can say for sure they're an interesting group that really owns their profession and lifestyle. I'm not sure why they're considered un-trustworthy, except carnies are generally low on the education and income scales. They don't earn much and are required to pay the show back for their living quarters and expenses. It's almost like a "company store" arrangement, and many get trapped in the lifestyle and have a hard time digging themselves out. It's interesting about Europe. Their version of "carnival" is entirely different than what we perceive here in the U.S. The Funfair is a mainstay throughout Europe and all you have to do is look one up on YouTube and you can be lost in a black hole of vids for hours. Every region has a big event with so many traveling rides it's mind boggling, and big successful showmen like Oscar Bruch have made their mark with huge portable coasters the likes of which we only see at theme parks. The flats are amazing and the dark rides and funhouses are too. They use decorative coins or tokens for tickets and there's a noticeable lack of fencing, rails, or protection around the rides, and little or no queue. If you want to ride you stand on the platform, even while the ride is operating, and rush for a seat when the ride stops. It's so bizarre compared to what we know, but it seems to work. Perhaps hungry lawyers and insurance companies over there haven't caught on. So, to Jeff's point, it seems the carnival over there doesn't carry the seemy show business stigma that it does here. I live in a state fair city and I hear over and over from folks that they don't trust the rides and wouldn't go on 'em. There are plenty of fine, reputable carnival companies here in the U.S. that provide family entertainment and treat their business, especially the safety aspect of it, as seriously as any amusement park would. They're also subject to strict inspection. But for some reason, here? We aren't buying it. And when news comes of an accident (like we saw in North Carolina, where the operator allegedly altered safety features,) it doesn't help. Found it on Youtube. Seems gentle.